When they reach the magic metre, it’s a very special moment. 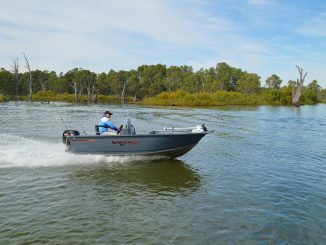 December marks the return of Murray cod fishing after a three-month closed season in our rivers and the majority of our impoundments. 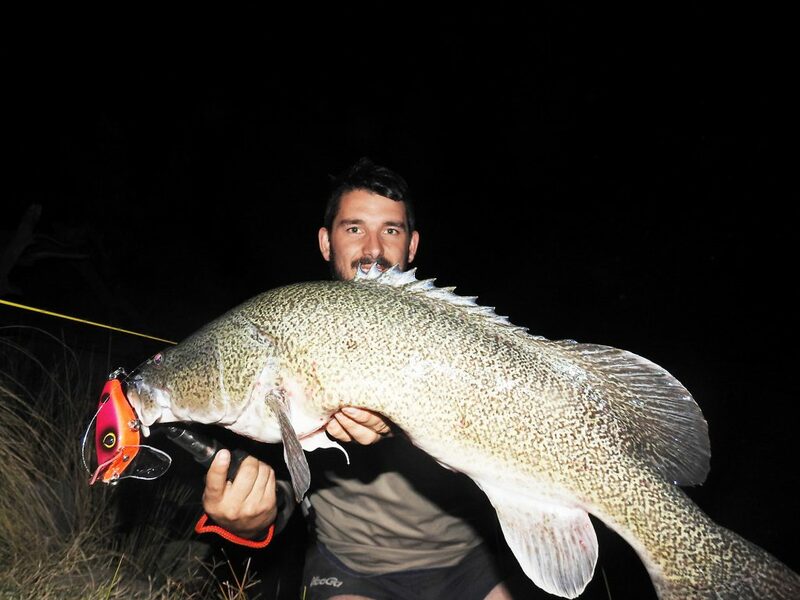 The Murray cod is the Australian icon of the freshwater – our largest growing freshwater fish and a major target for many anglers throughout the country. The best thing about December is not only the fact we can target these amazing creatures again, but it’s also the most productive time to do so. 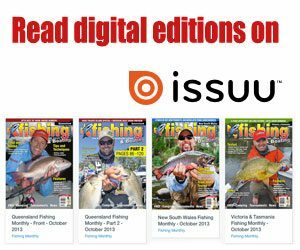 It has been a long three months for a lot of anglers, myself included, and luckily spring is the most fruitful time to target golden perch and bass, which keeps us freshwater anglers somewhat entertained while we count down the days until 1 December. The closed season started at the end of winter (31 August), a time when conditions can be tough, for both the weather and fishing. The open season in December offers a completely different scenario. The mercury and water temperature are on the rise, the days are getting longer and aquatic life responds right through the food chain from new weed growth to the dominant predator’s mouth. The cod have spent the last three months going through their natural spawning procedure (if conditions allowed) and they will be eager to feed back up after this process. Cod can get very aggressive over this breeding period and they can carry this aggression post-spawn. 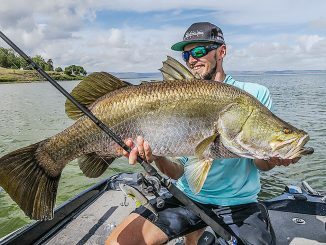 Add in the fact these fish haven’t had any angling pressure over the past three months and it’s a recipe for some hot fishing action. For me, the opening weekend in December produces the most fish hands down and the aggression they show early in the season is incredible. It’s not uncommon to land plenty of fish. The old faithful spinnerbait is a great choice early in the season. Swimbaits dominated the cod scene last season, expect the same this season. Surface fishing after dark can leave you shaking at the knees when they hit right in front of you. Pack light so you can cover as much ground as possible. Our river systems are so diverse and each provides a new aspect. 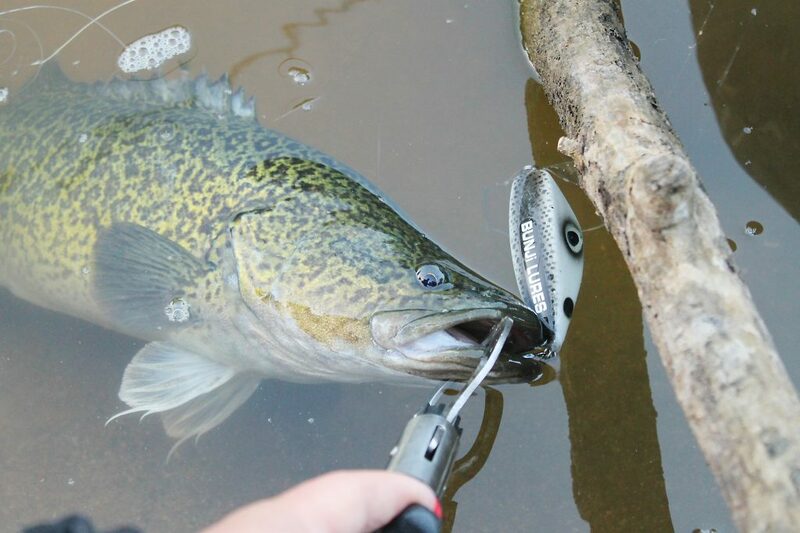 Lip grips allow the fish to be handled in the water and not on the dry bank. It’s not just the fishing, walking the riverbank offers so much more. Getting into the water with big fish for a photo keeps them in good health. Face to face with an Australian icon. Don’t discount impoundments early on in the season. A stunning river cod taken on a surface lure at first light. The fishing should be hot across all freshwater bodies and sometimes it’s hard to decide between rivers and impoundments. 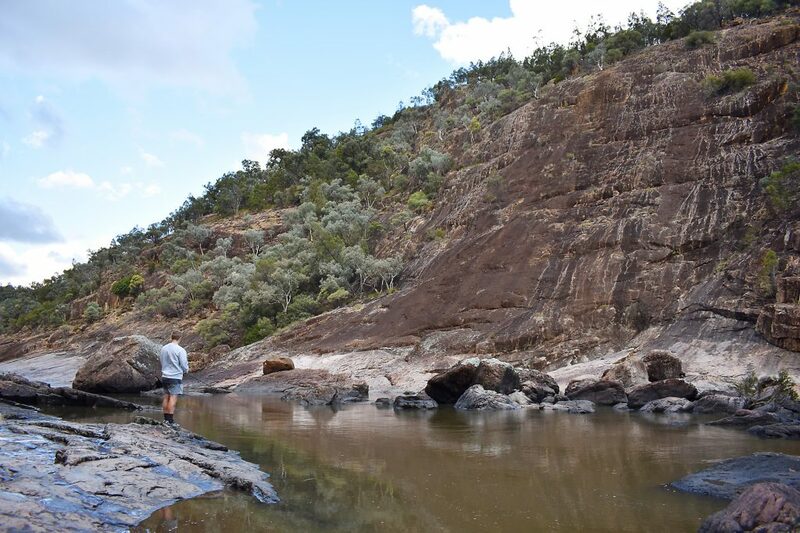 Although impoundments can provide some great fishing throughout summer, early season is all about the river fishing. There is generally less water between you and the fish and the fish are more willing to unload on anything that comes within range. 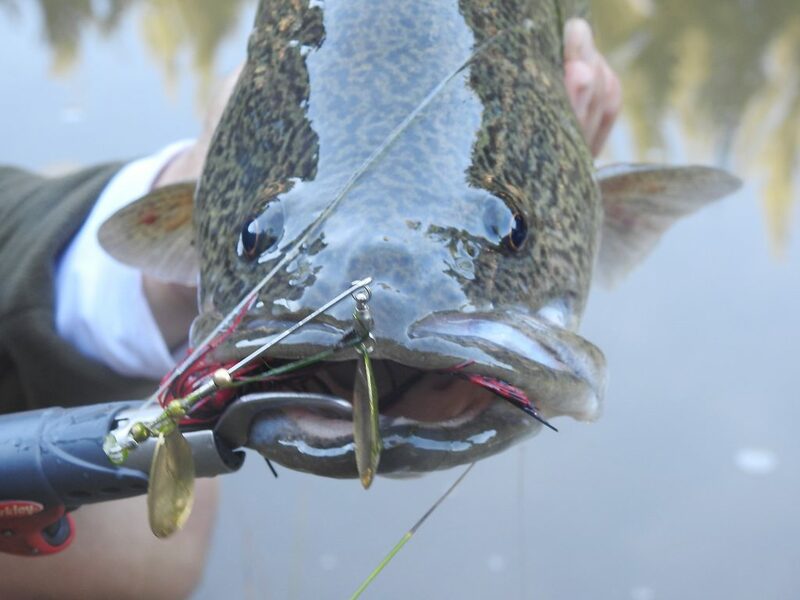 The low light surface bite in rivers throughout summer is one of the most addictive experiences across the board. A great way to explore your local river system is by doing an overnight hike and the December weather provides the perfect conditions to do so. By starting at a certain location and walking as far down or upstream from this spot and then setting up a makeshift campsite for the night is the perfect way to explore a system. This technique also allows the opportunity to be fishing the best holes at the prime times. Often I’ll use this method and set up camp at a location that seems productive. 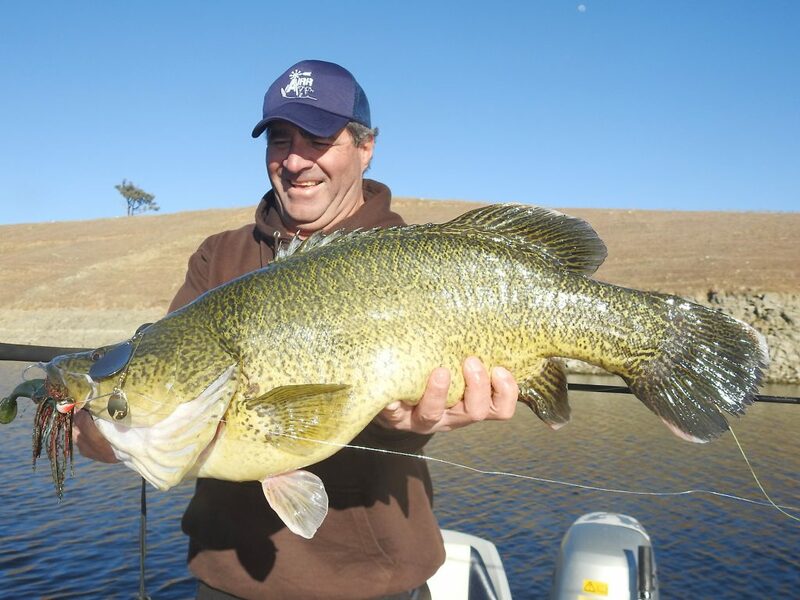 This allows the spot to be fished in the late afternoon, at night and early in the morning – all prime times for Murray cod. 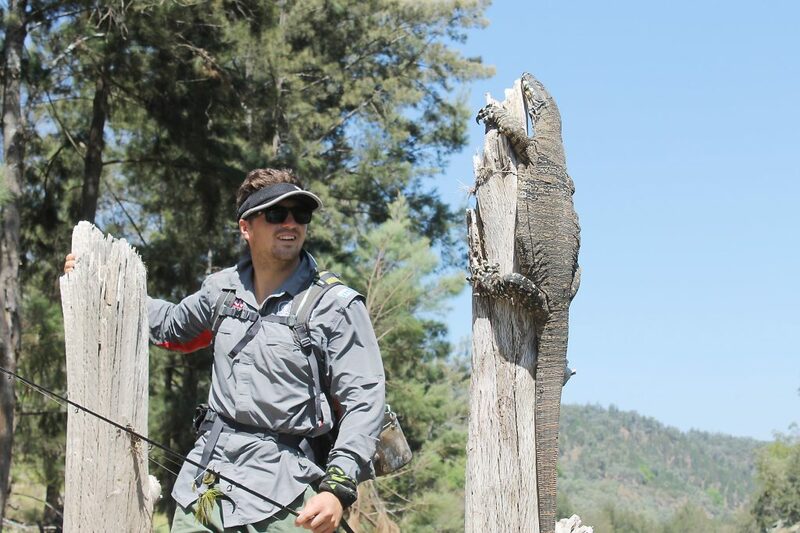 Preparation for trips like these is important and packing a decent-weight hiking bag with essentials is critical. I carry one tackle box filled with a range of lure options in my bag; the rest of the space is used to carry food, water and a camera. To the outside of my bag I attach Boga Grips, a Billy can or pan and a sleeping bag. Other luxuries include toilet paper, a sleeping mat and a personal hygiene kit. Packing water purification tablets lets you drink the water from the river, which saves you lugging a lot of extra weight. Prime time is a bit of a cliché in fishing and anytime you’re on the water is better the sitting at home. If you have the luxury, these prime periods offer the best fishing conditions. 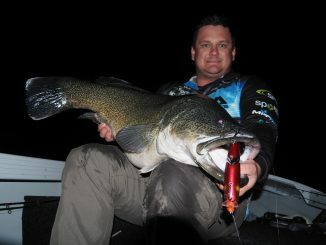 Early season Murray cod can be caught at any time, day or night by changing your approach, though late afternoon is consistently the best time to be on the water. With the hot days December provides the fish will often take refuge during the middle of the day when the UV index is at its highest. Once that sun begins its descent behind the western mountains and shade is cast on the water, the fish come out to play. 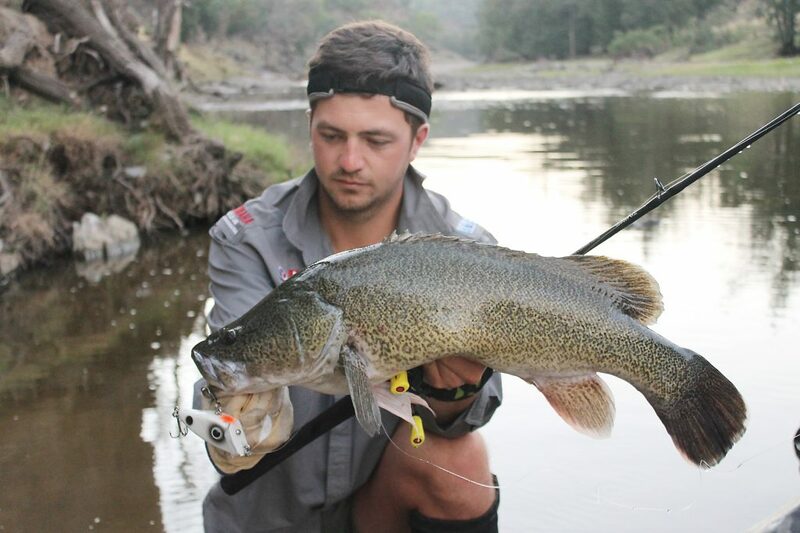 Murray cod are predominantly an ambush predator that hold tight to structure. In the low light, especially on late afternoons after a warm day, they will venture away from their home and search for food. These fish that are on the hunt will be the most aggressive and likely to crunch your offering, so changing your approach to target these fish is key. 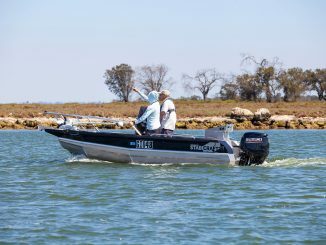 Shifting your cast from tight into snags and structure to more open water like the tail of a pool or the base of a rapid or fast water can produce some great fishing. During the middle of the day, however, you want to focus your attention on fishing deep in the structure where the fish will hang out most of the time. If a large afternoon storm system is forecast, don’t be shy, the build-up before a storm can provide some crazy fishing. The fish can really turn it on as the barometric pressure rapidly fluctuates, but often once the storm has passed the fish will shut down. Each cod season there is a lure trend or phase that seems to fool a large portion of the fish caught, from the spinnerbait to the surface lure and, last season, the swimbait. All forms of lures still catch fish of course, but it appears that trends are starting to occur in lure phases each season. Nonetheless the stable approach of spinnerbait during the day and surface walker at low light is perfectly suited to early season cod. As the fish are at their most aggressive this month, lures like spinnerbaits and chatterbaits that are most likely to catch the fish’s attention seem to get whacked pretty quickly. Fishing surface lures in the low light is a staple when cod fishing, and lures that paddle across the surface create the biggest surface eruptions, which is addictive. As the season moves on, the fishing will naturally get tougher and this is when lures that fool the fish with their natural attributes like swimbaits come into their own, but keeping it simple early in the season generally finds the fish. For the sake of it, I believe this year’s lure phase will be glide baits, similar to swimbaits but fished a little differently. We’ll see what unfolds. 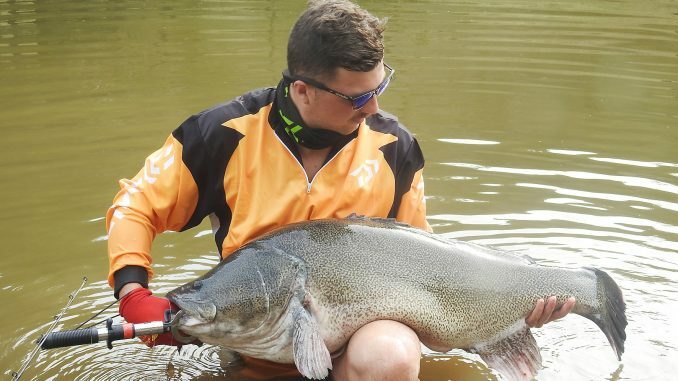 Looking after the fish is always priority when on the water, especially when dealing with Murray cod. 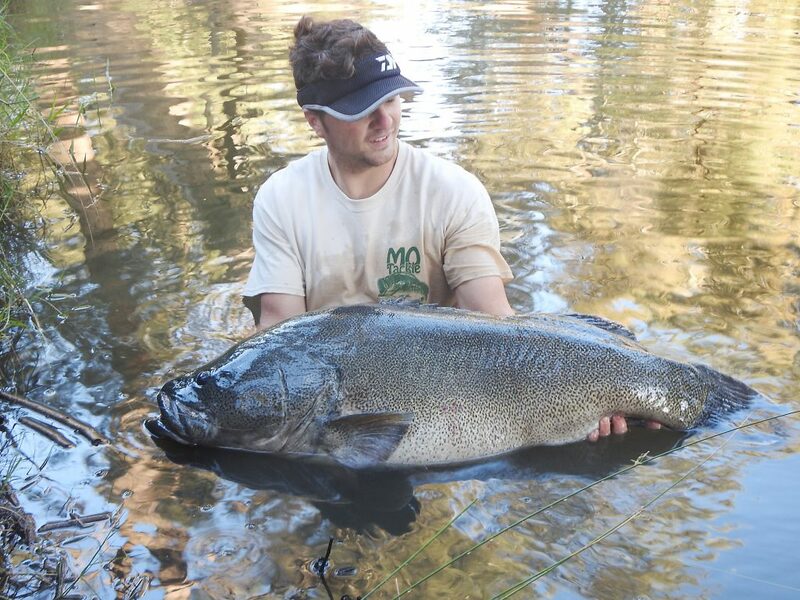 Over the past decade we have seen respect for these fish move in a real positive direction. Most anglers nowadays are strictly catch and release when it comes to cod and it’s great to see. Personally I believe they should all go back, especially in rivers where they are wild stock. As great as catch and release fishing is, it still needs to be completed in the right manner to ensure the survival of the fish. December temperatures can be quite high and keeping the fish in the water is essential. Only remove the fish for a quick photo before sending them home. The bigger the fish, the more care is needed. 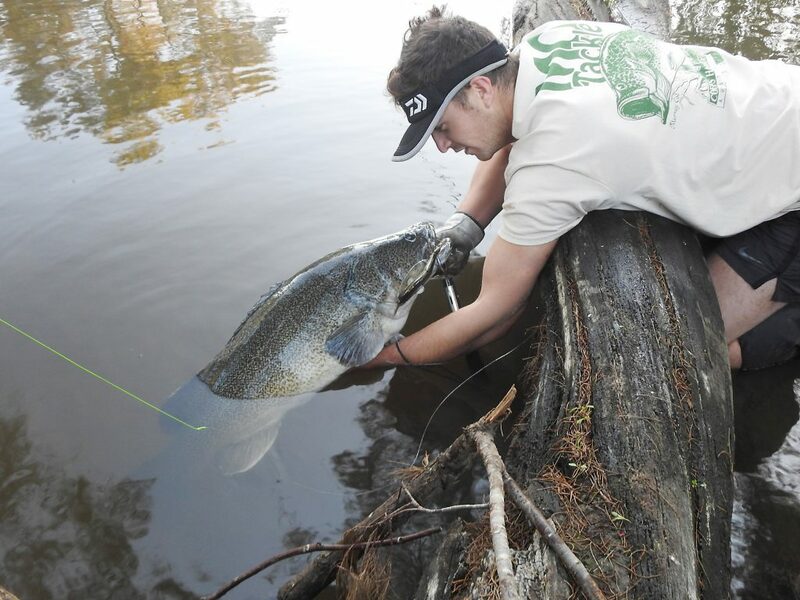 Supporting the weight of the fish at all times is critical in ensuring these big fish aren’t under excessive stress, which can lead to serious injury. Sometimes getting in the water with the fish for a photo is the best option. With summer temperatures high, sometimes a refreshing swim is needed anyway. 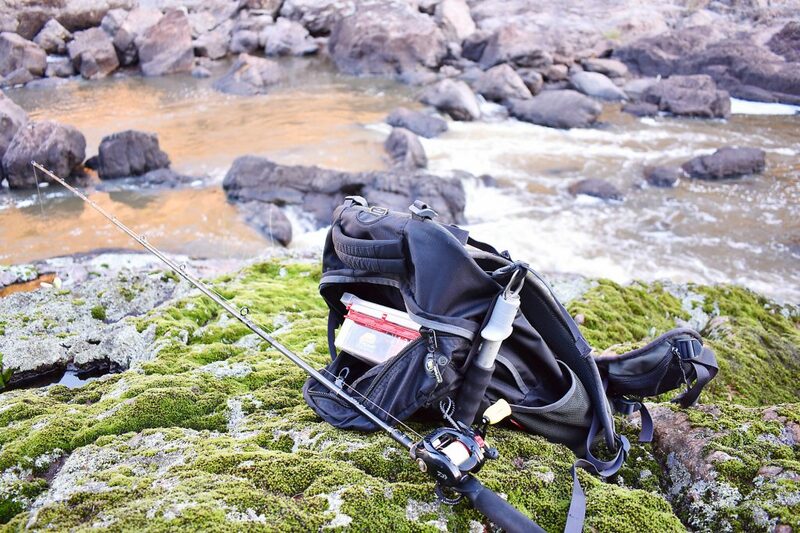 Preparation is key; always having a pair of lip grips handy will save both you and the fish a lot of drama. The fish can be held in the water while the camera is set up and the hooks can be removed from the fish safely, there is no need for the fish to be dragged up onto the bank. 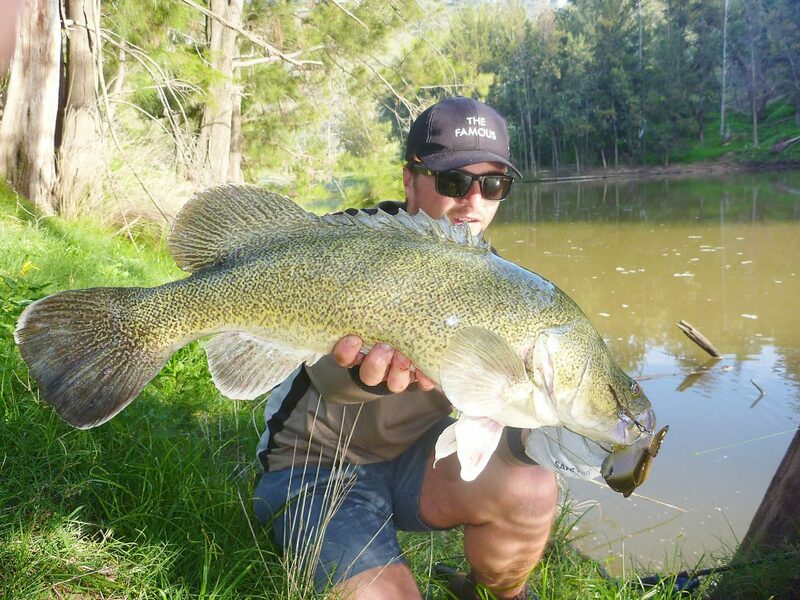 We all want to see healthy populations of Murray cod in our western rivers, so it’s great to see a real positive shift in fish safety year by year – let’s keep this going. 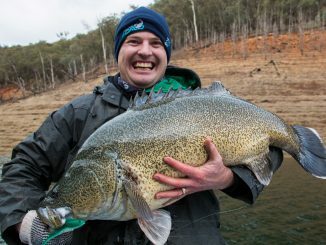 The closed season for Murray cod is very important and as anglers it’s our responsibility to respect these great fish, and give them a break and a chance to breed. It might be a tough three months for us freshwater fanatics but it’s all worth it once you’re on the water in December and the withdrawals all go out the window when you land that first beautiful Murray of the season. It makes you appreciate them that little more. Early season is the best time to be on the river – may it be walking, kayaking or boating. 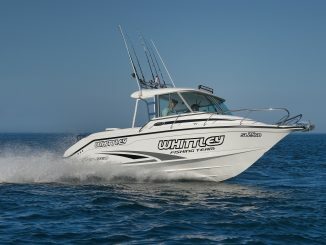 The fishing is consistently good and the weather is perfect to spend a day fishing or even camp for a few days. Get out there this December and chase our largest freshwater fish, respect the fish and our waterways and most importantly enjoy your time on the water.